Bone Broth is the New Starbucks! Finally, our nation is waking up to the awareness of this incredibly healing food and it is making the newsstands! Bone broth is having a serious moment. More and more health coaches, nutritionists, and beauty gurus are recommending it for its many benefits, from boosting gut health and fighting inflammation to providing a dose nutrients like magnesium, potassium, calcium, amino acids, and collagen. Fresh homemade broth or stock is an anti-aging bomb, magical healing food, and regarded as an important staple not just in the Weston A. Price Foundation diet, but apparently, BROTH is the new STARBUCKS! The bone broth made by Miller's Organic Farm click here contains natural gelatin which is a rich source of collagen (for your skin), glycine (an amino acid which aid digestion and improve protein assimilation), natural antibiotics, peptides, anti-inflammatory substances, and important minerals for bones and teeth, but in a unique form that is easy for the body to absorb (unlike supplements). It has no similarity to the chicken broth you buy at the grocery store (even if you buy organic), so don't be fooled! I have a pot of bone broth going every day. If you are not a fan of the taste or smell, you can dilute it 1:1 and add ginger, root vegetables and make a soup, cilantro or lime. Add a dash of salt and pepper and sip from a coffee cup before each meal. It is a wonderful pre and post workout “energy drink” and the cheapest anti-aging (along with a good night’s sleep) remedy you will get your hands on. Throughout my journey and healing from uterine cancer, as well as my pregnancy, after giving birth, and now through the recovery phase after having a baby and sleepless nights - BONE BROTH IS MY BEST FOOD FRIEND!!! I was drinking a LOT of bone broth while pregnant, to give my baby the amino acid glycine, which is conditionally essential during pregnancy. Glycine is essential for the synthesis of the placenta and for protection of both, mother and baby from toxins and stress. Now I still have at least a small cup every day to nourish my body. For those of you who are unable to buy the broth from Miller’s Organic Farm, we have a lovely alternative made and delivered by our dear friend, “The Flavor” Chef Lance in California. In folk wisdom, rich chicken broth - the famous Jewish penicillin - is a valued remedy for the flu. Meat and fish stocks have been used almost universally in traditional cuisines - French, Italian, Chinese, Japanese, African, South American, Middle Eastern and Russian; but the use of homemade nourishing stocks and sauces has disappeared from the American culinary tradition. Simple to make, soothing and nourishing, bone broth is one of the oldest, most affordable homemade foods, often used as an elixir to cure ailments and nurture the sick. 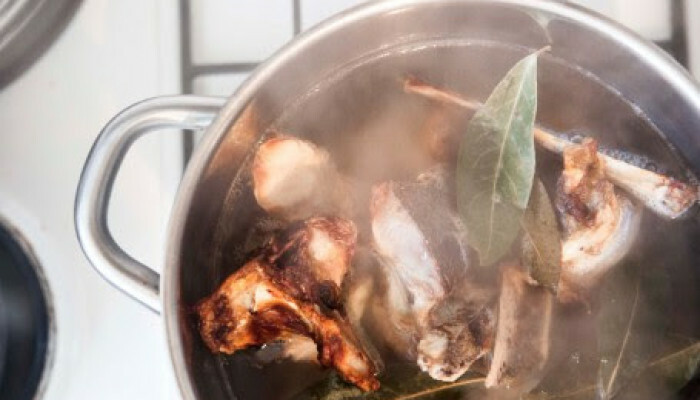 True bone broth is made by boiling bones and pieces of meat in purified water for 36 hours (for beef bones) or 24 hours (for chicken bones). The liquid is then strained and cooled. Now remember, that the broth you will make, will only be as healthy as the ingredients that you use! It is important to only use bones from organically farmed animals without any antibiotics. You can buy the bones from Miller's Organic Farm as well click here. Beef bone broth is particularly rich in material from cartilage and tendons like chondroitin sulphates and glucosamine for joint pain relief. The resulting broth is a nutritious gelatinous food that aids in digestion of proteins. To help heal a damaged gut lining, you need large amounts of easily digestible substances like amino acids, gelatin, glucosamine, fats, vitamins and minerals, all found in good-quality bone broth. A good broth is rich in gelatin (a source of protein that helps counter the degeneration of joints) and collagen (which improves the condition of skin). Bone broths made with fish bones and heads provide iodine and can help strengthen the thyroid. • Remarkable results in the treatment of cancer, rheumatoid arthritis and bone disorders. The public is generally unaware of the large amount of research on the beneficial effects of gelatin taken with food. Gelatin, although it is not a complete protein, it allows the body to more fully utilize the complete proteins that are taken in and acts as an aid to digestion. The use of gelatin-rich broth on a daily or frequent basis provides continuous protection from many health problems.